This solid sandstone climb with loose dirt on top was intimidating, but the Maxxis Coronado smashed it. We become used to seeing hard-terrain tires with closely spaced, relatively short tread blocks. Most have a pretty square profile as well. In light of that, we assumed that the Maxxis Coronado was a mud tire with widely spaced, deep tread blocks. 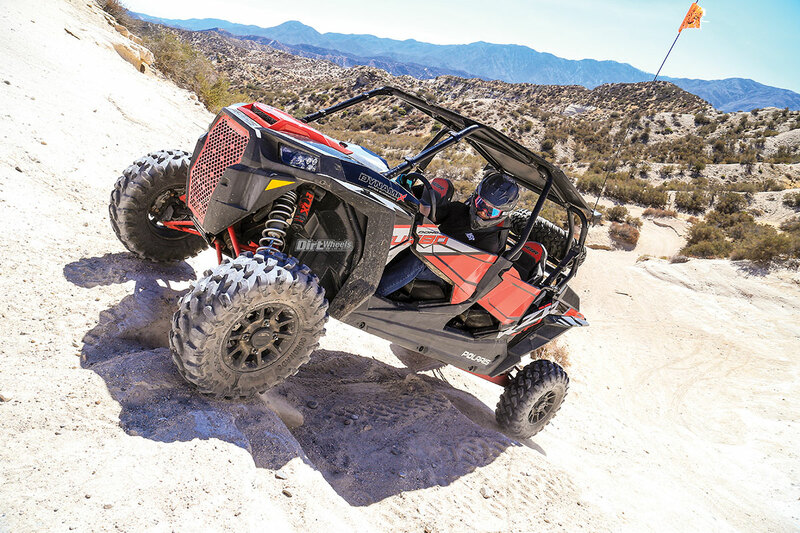 Obviously, we were a little surprised to find that the Coronado is what Maxxis calls “the ultimate desert tire for your ATV or side-by-side,” and claiming that the compound is long-wearing and formulated for high speeds and high temperatures. It also has an eight-ply carcass that is almost a requirement for the speeds and buried rocks we regularly encounter. We feel that the Coronado may have the best cross-over to mud and soft terrain of any tire aimed at the western U.S. The Maxxis Coronado is designed as a multi-purpose desert tire with serious toughness with a range that is impressive. Tires with tall, generously spaced lugs can have a staccato ride, but the Coronados feature true radial tire construction, and the center of the tread features the largest sides of the tread blocks spaced closely for a smooth ride. Each tread block looks like an apostrophe, but the lugs are stepped. On the biting sides, the top edge is stepped down, so each block has two biting edges. Currently, the Coronado is available for 12- and 14-inch rims. Smaller sizes come in a narrow front/wide rear, but at 28x10R14 and 30x10R14, there is just the single size for front and rear. The largest size available is 30 inches. The standard Maxxis Bighorns that came stock on our Polaris RZR Turbo 4 Dynamix are 29x11R14in the rear and 29x9R14 in front. The Bighorns are actually a bit taller than 29 inches and are just shy of 11 inches wide in the rear and 9 inches wide in the front. We used the stock wheels, so the rears were a little wide for the 10-inch Coronado and the fronts were a little narrow, but they mounted up fine with a desirable rounded profile. They are 10.6 inches wide, so the rears are a tiny bit narrower, but the fronts are much wider than stock. We have a local area that offers hardpack, rocks and deep sand washes littered with more rocks. Typical “desert” tires are happy on the firm parts but lack drive in the sand washes. We expected the satisfying lunge forward the Coronado has in the soft, but honestly expected them to skitter on packed surfaces. We were wrong. Traction was superb on packed dirt and sandstone slabs. The Dynamix literally bolted forward when we hit the throttle. We slammed through large, littered, sharp-cornered rocks without a single cut or tread tear we could see. In fact, aside from microscopic feathering on the front edge of the knobs, the tires look brand new. The wide fronts push a little in the loose, but overall work great. Compared to the lighter-duty Bighorns, the Coronado’s eight-ply construction transfers more sharp-edged terrain through the suspension. That is a decent trade-off for the increased toughness of the desert tire. It wasn’t a good time to find mud, but we are confident the tire will cross to mud and loam very well. Overall, the Coronado is a great wide-range tire. It boasts excellent bite like the Bighorn in a tougher tire. 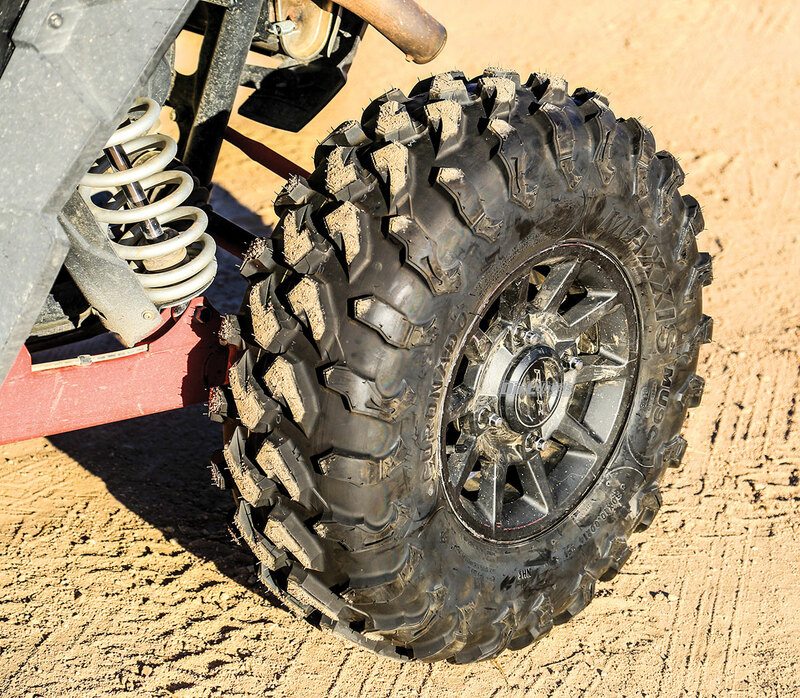 Maxxis has a large lineup of tires for your quad or UTV, so go to .maxxis.com to check out their tread lineup and find a dealer near you.